In two months, my family is walking to raise funds for food allergy research, education, awareness and advocacy. Here’s why. For millions of people like me who have food allergies, the simple act of grocery shopping or eating out can be a minefield. Food allergies range from mild to immediately life-threatening, and while some treatments show promise at suppressing them, and emergency medication (if given right away) is usually effective, the only reliable course right now is avoidance. That’s not as easy as you might think in a world where packaged foods seem to have 500 ingredients, and a lot of people (including restaurant cooks!) are unaware of or outright dismiss critical medical needs as simple preferences. When I ask you whether your homemade cookies have nuts in them, or when I ask the waiter whether the salad dressing is based on peanut sauce, it’s not because I want attention. It’s because I don’t want to spend the afternoon in the hospital. Or worse. All these are reasons that my family is walking to raise funds for the Food Allergy Network. Their mission is to spread awareness, provide education and advocacy, and promote research into food allergies. You may have seen them in the news recently as they’ve pushed for state and federal laws encouraging schools to carry stocks of epinephrine auto-injectors — and allowing them to use them — so that children who experience a serious reaction at school can be kept alive. The Los Angeles walk is coming up on October 21 in Long Beach, 60 days from now. Please donate or join our team! 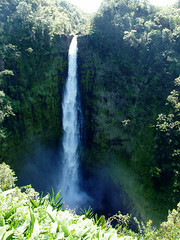 This entry was posted in Food and tagged allergies, allergy walk, Fundraising on August 22, 2012 by Kelson. Someone once asked me if my food allergies — the ones that require me to carry emergency medication so that I can keep breathing if I eat something with peanuts — could be all in my head. I pointed out that they can be diagnosed by a blood test, and asked how my head could influence the results of a test on a vial taken to a lab three states away. This is just one example of the need to increase awareness of how real and serious food allergies can be. In October, Katie and I will be walking to support the Food Allergy Network’s mission to promote research, education, awareness and advocacy. We’d appreciate your support! 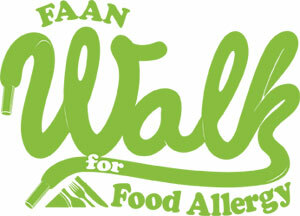 » Donate or Join our Team for the Walk for Food Allergy! This entry was posted in Food and tagged allergies, allergy walk, Fundraising on August 2, 2012 by Kelson. 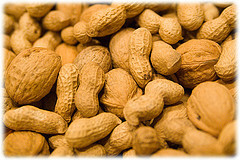 Allergies to nuts, grains, vegetables, seafood and milk are common. Allergies to meat? Much less so. But that’s starting to change. A few months ago I read about adults (author John Grisham in particular) developing an allergy to red meat after being bitten by ticks. * And not just a low-level allergy like your face turning red — we’re talking full-on hives and anaphylactic** shock, the kind of thing that requires you to carry an Epi-Pen to make sure you keep breathing long enough to reach the emergency room. Researchers have determined that the lone star tick’s bite can cause the body to produce an IgE antibody for a sugar called alphagal, which is found in mammal meat. The result: from then on, you’re allergic to meat. With most allergies, we know the process, but we don’t know what gets the ball rolling to begin with. We know that in people who are allergic to a food, exposure to it causes an IgE antibody reaction that triggers a massive release of histamines that sends the body into some level of shock, but we don’t know why some people have that reaction and others don’t. There are a lot of ideas being investigated, with varying amounts of supporting evidence, but there’s still nothing we can point to and say: “This caused you to be allergic to nuts” or “That caused you to be allergic to milk.” Advice to parents concerned about keeping their child from developing allergies is all over the map. That’s why Katie and I are walking in this year’s Walk For Food Allergy. The event raises money for the Food Allergy and Anaphylaxis Network’s mission to support allergy research, spread awareness (you’d be amazed at how many people dismiss allergies as inconsequential or even bogus), provide education and advocacy for people living with food allergies. *Naturally, this was a few days after I hiked a severely overgrown trail without taking precautions against ticks, so I freaked out a bit, but I also hadn’t found any ticks when I got home from the hike. **Fun fact: Chrome’s spell-checker doesn’t know “anaphylactic,” and suggested such helpful alternatives as “intergalactic” and “anticlimactic.” Not sure about the former, but I get the impression a lot of viewers suffered “anticlimactic shock” when watching the Lost finale. ***Or at least we know what primes it. There’s still the question of why only some people who are bitten by the lone star tick go on to develop the allergy. This entry was posted in Food, Highlights, Strange World and tagged allergies, allergy walk, Fundraising, health, ticks on June 21, 2012 by Kelson. The Food Allergy Walk went well. There was a good turnout, apparently the highest yet for the Los Angeles event, which is in its fourth year. According to the event website, they raised about $43,000 of the $50,000 they had aimed for, but that’s only online donations. They may get closer once cash and checks are counted. Thank you again to everyone who sponsored us! You helped us raise $1040.05 for the cause ($120 of it offline) between the two of us! The route was one mile each way along the walking path behind the beach up to the Santa Monica Pier and back. It ended up being overcast and chilly, a far cry from the 77 degrees and sunny predicted a few days ago, but at least it worked out well. Afterward we went to Café Crêpe for lunch. I wore a Flash T-shirt, and Katie put a Flash shirt on J. (We had him in the stroller.) We started off the walk next to a family wearing Superman T-shirts. For the record: we finished first. The turnaround point coincided with the finish line of a 100-mile endurance walk/run, so on the way back we saw several thoroughly exhausted runners plugging away. 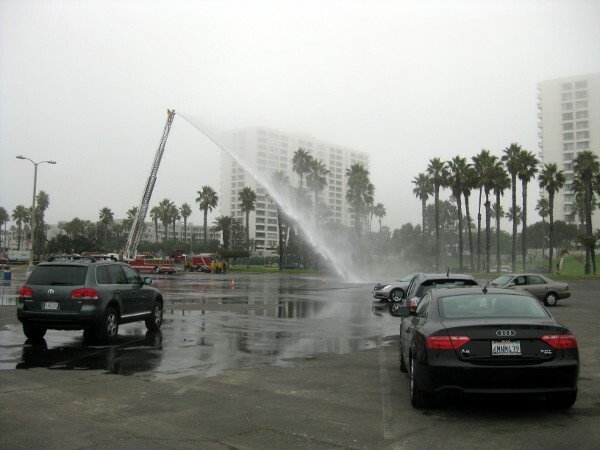 When we arrived, a huge section of the beach parking lot was cordoned off, with a half-dozen fire trucks (at least one marked Hazmat Response or Hazmat cleanup). One truck had its ladder fully extended in the middle of the lot, and they were pressure-washing something off the pavement from the top of the ladder. We never did find out what it was. This entry was posted in Food and tagged allergies, allergy walk, Fundraising, Santa Monica on October 23, 2011 by Kelson. A huge thank-you to those who have sponsored me so far: Jason, Wayne, Pavana, Marisa, Daniel, Devin, Greg, Damon, Jesse, Lia, Ken, aunt Julianne & Craig, and mom & dad. It’s coming up this Sunday in Santa Monica, California (near Los Angeles), and FAAN has other walks planned across the country. You can help with any amount down to US $10. If you’d like to contribute, please donate at my fundraising page. As I write this, I’m $230 away from the #10 spot on the top 10 list for the Los Angeles walk. Anyone want to help push me into the top 10? 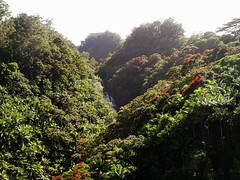 This entry was posted in Food and tagged allergies, allergy walk, Fundraising on October 21, 2011 by Kelson.